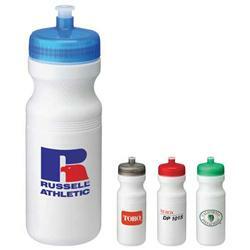 BPA Free USA Made 24oz Sports Water Bottle, twist on lid with push/pull drinking sprout. 100% Biodegradable- Eco-Friendly. Made with recycled material. Top-Rack Safe. Microwaveable. For more eco friendly water bottles email our sales team and we will send further options. PLEASE NOTE LIDS SHIP UNASSEMBLED! RUSH PROMOTIONAL ITEM - FREE 1-DAY RUSH PRODUCTION AVAILABLE! Available Colors: White Body with Blue, Red, Green or Black lids. Dimensions: 24 o, 9-7/8"H x 2-7/8"W.
24 oz, BPA free, recycled, biodegradable.